The Stiga Multiclip 50S Rental self-propelled mulching lawnmower has an easy start Stiga SA55 150cc engine with AVS, adjustable handle, robust galvanised steel chassis and ball bearings wheels. A 48cm/19" cut makes this mulching lawnmower suitable for larger gardens up to 50m x 50m. The Stiga Multiclip 50S Rental self-propelled lawnmower is equipped with an easy start Stiga SA55 OHV 150cc engine and the unique Stiga anti-vibration system, which reduces the risk of White Finger or HAVS at the end of a full days work. This model has an adjustable handle enabling you to reach into those awkward spots, cut alongside walls or around obstacles. The robust galvanised steel body has a powder coated paint finish for longevity and the wheels are fitted with ball bearings for smoother running. 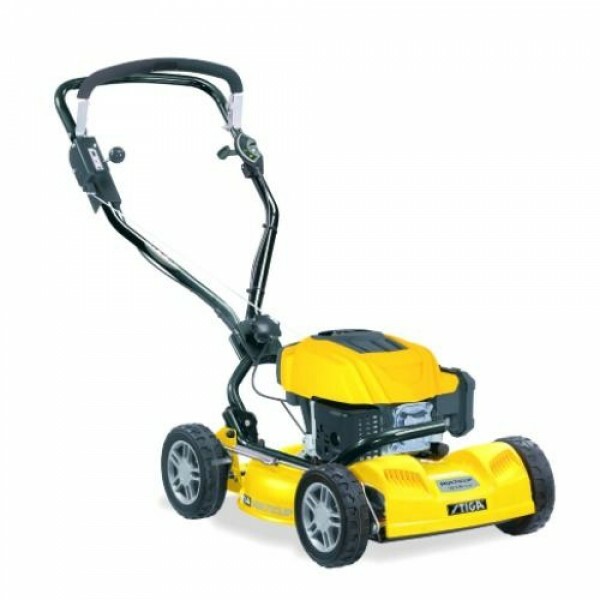 The Multiclip 50S Rental is equipped with a 48cm/19" deck and with 5 heights of cut ranging from 31-75mm easily adjusted by a single lever, you'll be assured of a smart professional finish to your lawn. This self-propelled mulching lawnmower is covered by a 2 year manufacturer's warranty and is suitable for larger gardens up to 50m x 50m.